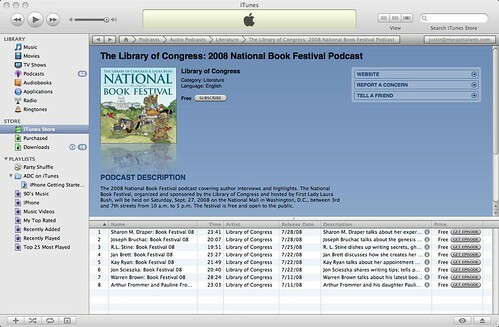 The Library of Congress National Book Festival author interview podcasts are now available for subscription and download on iTunes. You can get both the 2008 and the 2007 interviews. The Library frequently holds events and interacts with some of the smartest literary and academic minds in the world. They will typically make recordings of these interactions and make them available via their Web site. It’s SO exciting that the Library is now getting this media in a form that will be even more accessible and useful to Congress and the American people. Please download these podcasts. They’re REALLY cool. As I think the Library of Congress and the government as a whole is learning, anyone that wants to be able to publish content on the Web needs to start thinking more about how they’re going to distribute their content all over the Web and not just how it’s going to be found on their Web site. This is awesome news, thanks for sharing! I love hearing author interviews on NPR and the like, but having a podcast that I can play anytime is going to be great for those roadtrips where I’m not in the mood for music.